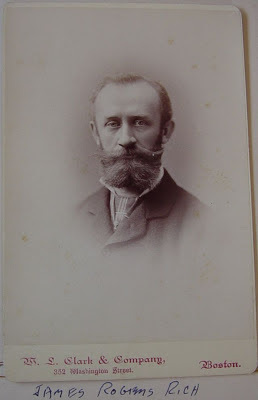 Cabinet photograph of a man identified on the front as James Rogers Rich or James Robins Rich. The photograph was taken at the Clark studio at Boston, Massachusetts. James was presumably related to Eunice Hacker (Rich) Cartland, wife of Isaiah Cartland of Portland, Maine. James' photograph was found with others related to the Cartland family. See a listing of the photographs here. James was born in May 1847 at Boston, Massachusetts, the son of Thomas P. Rich and Mary Newman (Rogers) Rich. He died at Marblehead, Massachusetts, on July 17, 1910. His death certificate noted that he was single and that he had been a landscape painter.